Last month, I had the opportunity to perform some remote analysis for Alliance as well as offer a second opinion on a lot of topics surrounding scrims, tournament, mindset, approach etc. I wanted to thank Jordan for involving me in the process and allowing me to share portions of my brief journey. It was invaluable experience and gave a great insight into the professional scene. Someone had posted on Leviathan's ask.fm account where Jordan mentions that he would like to help any analysts trying to break into the scene. 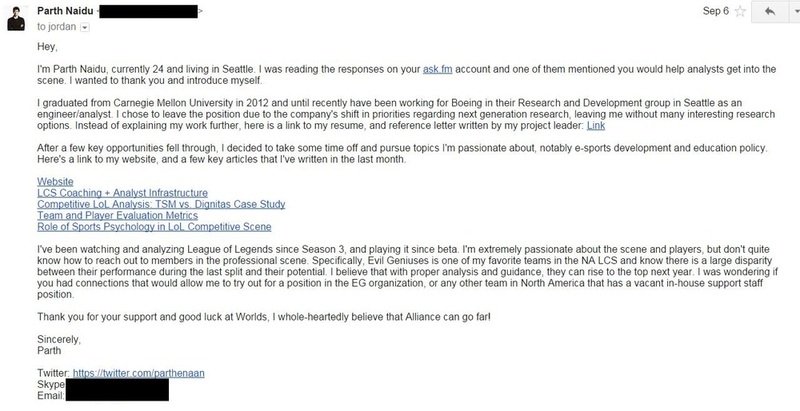 While my end goal isn't to simply do analysis, I thought it would be an interesting experience, so I sent him a detailed email with my resume and a reference that my project manager at Boeing wrote for me along with links to my website and writing asking to be introduced to a team in NA. With his busy schedule, I wasn't actually intending an email back before Worlds was over so I was pleasantly surprised when a few days later he replied saying that he was impressed with my qualifications and thought my perspective would be valuable. Additionally, he asked if I would be interested in helping him and Alliance at Worlds. I was pretty excited to just be involved in the process and I added him on Skype immediately. The next day, we spoke on Skype for the first time and he mentioned that he'd read some of my articles and thought I would be a positive influence to the team. We delved into some core topics in that first conversation and towards the end, my first assignment was to review their scrims and take notes. They were BaronReplay files, a software I had never used until now, but it was pretty intuitive and easy to set up. A few days later, I was also tasked with recording and uploading the video versions of scrims onto youtube privately so that the players could watch them on other devices. He also mentioned the idea of creating a video library of games for players, which I think has a lot of merit especially during the regular season. After receiving scrim data, I was also invited to several chat groups labelled NJWS and C9, each with 7-8 people. While it was interesting to participate in the discussions, I personally didn't feel that I was adding much, and I stopped engaging in the conversations. Instead when Jordan asked someone to put together a summary presentation on Cloud 9 and Shield, I realized that it would be pretty interesting to rewatch games from an analyst's perspective. Since I already knew the general dispositions of both teams, I decided to narrow the focus to vision strategy because it was something both teams did well, and what Alliance somewhat lacked at the time. I rewatched and took detailed notes on Cloud 9's playoffs matches [8 games] and Shield's gauntlet run [10 games]. Then I converted these notes into summaries of each player and their inclinations as well as how the teams approached visions with respect to their compositions. I'm not sure how Jordan or players of Alliance used this work, but the presentations would've easily been three times as long depending on the perspective. I decided to focus on vision control, but objective-based movement and teamfight/skirmish strategies are similarly important. Separately studying these elements before synthesizing them into a cohesive team strategy is the next step for analysis in western League of Legends. Scrims revealed to me that Alliance's biggest flaw was vision control, causing them to lose control of early dragons and allowing opposing teams to freely roam around the map. After I pointed this out, Jordan expressed that they had resolved the issue in the early game, but still struggled with mid and late game decision-making. I had been thinking about this topic a lot during my brief involvement with helping a team in the Challenger scene. I helped break down the mid-late game into objective control, vision, and map movement for the shotcaller, and offered recommendations on how to improve each. Some of these included reviewing replays with partial team vision and replaying team movement before major objectives or fights. Next I advised on pausing replays at various points in the game and having the shotcaller discuss each team composition, their strengths, and end goals, before watching the remaining replay to measure the differences between expected and actual outcomes. Other suggestions included practicing certain elements like overdoing vision control to appreciate the value of information and then scaling back the amount to increase efficiency in order to complement compositional strengths. Next, I was told that the pick/bans for each team were done the day before the games. I wasn't asked for it, but I decided to consider several pick/ban scenarios with the help from a few friends. Assuming certain bans like Zed and Rumble from Alliance's side and opposing teams to certainly ban away Irelia and possibly Zilean, I made the following presentation focusing on team compositions, their synergy, and how to approach each with vision. I didn't have the opportunity to speak with players about pick/bans or priorities, but I was hoping this would be enough based on my knowledge of their champion pools and resource allocation. Overall, I spent approximately 60 hours reviewing videos, discussing ideas, and creating the presentations. Outside of analysis, Jordan and I spoke a lot about how to approach the game and tournament. The first discussion revolved around expectations and mentality. At the time he was concerned about the players' doubts about their own condition and ability to beat the top Korean teams as well as the community's reaction to his confidence on social media. Drawing from my experience and my conversation with Evan McCauley, we talked about the difference between having confidence in your abilities and the issues with displaying that confidence. Also, it was my contention that the benefit of humility is that it lowers community expectation and therefore reduces the pressure from players to perform, allowing them to concentrate on the task at hand. Next, as Evan and I had discussed earlier, I pointed out methods to build confidence from reaffirming faith in their fellow teammates' skills to offering constructive criticisms in a 1v1 conversations instead of group setting. Again, these were merely discussions and I was simply offering my perspective, but it was encouraging to see support staff actively consider and attempt to solve these issues. I wanted to thank Jordan (@LeviathanLoL) for giving me this opportunity to work alongside the team and for allowing me to share my experiences. Even though Alliance still has a lot to learn, I believe that the top western teams are at least equal with Chinese teams and rapidly closing the gap onto the Korean scene. However, an influx of efficient support staff and increased professionalism are the next hurdles to furthering the western scene. I would encourage anyone with the interest or passion to reach out to members in the industry. In my experience, I have found that everyone in the scene is very receptive of new members and are willing to help and encourage growth.